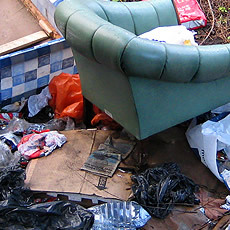 We offer rubbish clearance services to clients across the Manchester area. Unfortunately, due to the health issues, laws and regulations surrounding asbestos use and disposal, we are unable to take any form of asbestos waste. You can rest easy knowing that Rubbish Clearance Ltd. are fully insured and covered up to a value of £10 million. We accept a wide range of credit and debit cards as well as cash payments as standard. Is Any Waste. An environmentally friendly company? We have made an incredible commitment to the environment and as such we are fully licensed by the Environment Agency. We vow to dispose of your rubbish in an eco-friendly a way as possible, with over 88% of all waste being recycled or diverted away from landfill. What’s more, we only use fully licensed recycling centres. We pride ourselves on our environmentally friendly methods and give you the peace of mind of knowing that your waste will be disposed of in the proper manner. Why use Any Waste. Instead of hiring a skip? With Any Waste. you only pay for the items that you need taken away, meaning that you only pay for the space you take up – it doesn’t matter if you don’t use all of the space available to you, you will only ever pay for what you use! More often than not, this works out much cheaper than hiring a skip and our friendly and experienced professionals take care of all of the loading for you, making it a stress free experience all round! What kinds of rubbish clearance do we offer? We offer a wide range of rubbish clearance services in the Manchester area, both domestic and commercial waste can be cleared. We consider a range of waste including; general household waste, furniture, appliances, commercial rubbish, driveway clearances and a whole host of other services! No, our quotations are simply estimates, based on the quantity or weight that we will be expecting to clear. If the quantity or weight differs significantly, then this will mean that the cost will be altered accordingly.